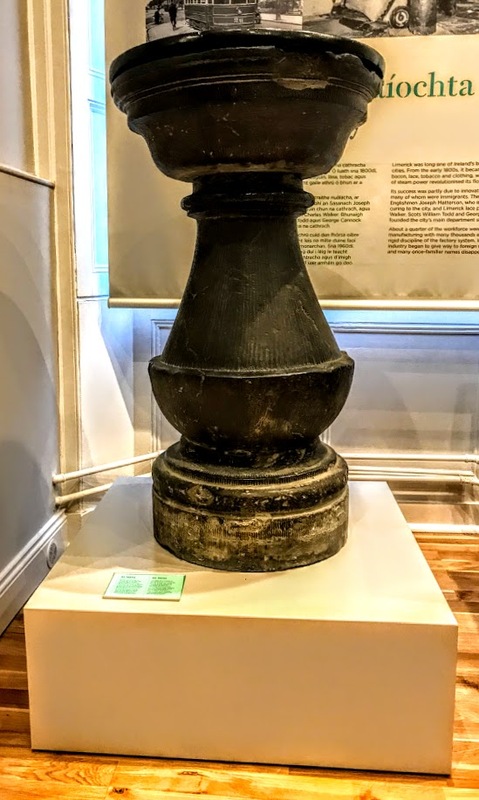 One of the curious exhibits in Limerick Civic Museum is the Nail, which was once located in the Exchange in Nicholas Street, beside Saint Mary’s Cathedral. This Nail, made of limestone and covered with copper, was set up by Robert Smith, the Mayor of Limerick, in 1685, to facilitate the exchange of money between trading parties. Robert Smith is said to have engraved his name on the Nail with his own hand. The phrase ‘Paying on the Nail,’ meaning immediate payment, is said to be based on Nails such as this. But the Nail is not unique to Limerick. The nails were common throughout Ireland and England, and these bronze pillars, can also be seen outside the Corn Exchange in Bristol and the Stock Exchange in Liverpool. The nails In Bristol were erected in Bristol from in a period from 1550 to 1631. Limerick merchants issued their own tokens in the 17th, 18th and 19th centuries, and the private banks in Limerick issued their own banknotes into the 19th century. But the Nail in Limerick fell into disuse when the Exchange was closed after a new town hall opened in Rutland Street in 1846, and the nail was then moved to the Town Hall.